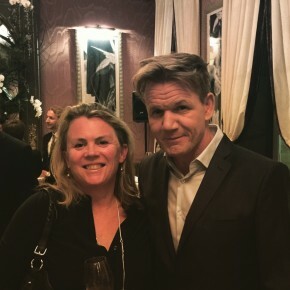 We were delighted to catch up with Gordon Ramsay last week at the launch of his new restaurant in Bordeaux, Le Pressoir d’Argent. He was on fine form and looking fit for his forthcoming Ironman challenge (not something we know much about) and many of his London team were there. Clare Smyth, the three Michelin star chef from his eponymous restaurant in Chelsea, gave us a tour of the impressive kitchen, along with our old friend Stuart, the group MD, and Nicolas, the Food and Beverage Director, and Angelika, the wine co-ordinator in London. Great photo of you Angela. It looks like it was a fun night. Thanks so much for another great stay at the farmhouse. We all enjoyed it and the wine.